I’m not much of a golf fan unless it comes in the form of Putt-Putt or the video game Hot Shots Golf on the Playstation. When I heard about a tabletop golf game from Bellwether Games, I’ve got to admit that I was intrigued to see this hit the table. Mars Open is the latest game from Bellwether Games and is being funded via Kickstarter through December 4, 2017. This game includes everything you need to turn your table into a golf course that the whole family will enjoy. 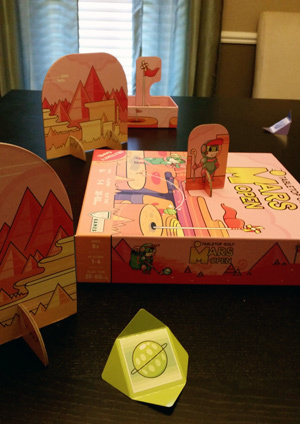 Mars Open is a dexterity game that has players flicking cardboard golf balls toward the square hole on the table. The game contains cardboard obstacles and even uses the box itself to build each hole. The design of the “golf ball” is really creative. As you experiment with flicking this cardboard piece, you’ll find that you can pull off some really cool tricks. The rule book for the game contains 27 different hole configurations from easy to expert. This is only a starting point since you can really create anything you want using the items in the box. I love that Mars Opens acts like a toolbox for creating great games that can be as difficult as you want. Mars Open uses every item in the box, even including the box, to create different challenges. Need a change of elevation? Use the game box to elevate the hole. Need a small obstacle? Park the cardboard golf cart in the way for players to shoot over or around. The game is incredibly satisfying when you flick the ball just right and land a shot in the hole. By flicking to the right of the ball, a player can curve their shot to the left around obstacles. Just like any dexterity game, the more you play, the better you’ll get. Mars Open is a unique game that makes the game of golf exciting for the whole family. This is definitely one game that should come out during a party or family gathering. The game is perfect for running a small tournament at the house or game convention. Since the game is so modular, just about any size table will work. We played on tables that were just under 6 feet up to 8 feet in length. The moment that convinced me that Mars Open belongs on our game shelf was when my kids told me not to return the prototype. We had so much fun with the game that they were sad when we shipped it back. I’m really excited to see this project go into production and see how the board game community creates new courses for our table. You can help fund Mars Open from Bellwether games though December 4th by visiting the Kickstarter page today. Bellwether Games provided us with a prototype copy of Mars Open prior to the Kickstarter campaign. This in no way influenced our opinion on the game. Previews are a glimpse into an upcoming game with the pros and cons that we experienced prior to production of the game.